Any survey of worldwide horror cinema would be incomplete without mention of any Hammer movies. Many DG readers are no doubt well-acquainted with this catalogue, but since Lincoln Center is showing THE BRIDES OF DRACULA this weekend, it felt like a nice occasion for a quick primer. Hammer Film Productions was a British production company whose heyday was the late 1950s to the late 1970s. The Hammer brand has actually returned recently, under new management (2012’s THE WOMAN IN BLACK was a surprising pleasure), but for the purposes of this article I’m going to stick to the old-school. Hammer made all kinds of movies – from science fiction to comedy to prehistoric adventure – ONE MILLION YEARS B.C., with Raquel Welch in not a lot of clothes and a bunch of Ray Harryhausen dinosaurs, is a personal favorite – but they are most renowned for the series of bloody, classy, bloody classy horror films that they churned out with methodical regularity.Hammer was something of a repertory company for those years. You see many of the same names cropping up from film to film: Terence Fisher (director), Jack Asher (cinematographer), Jimmy Sangster (writer, who just passed away, in August of 2011), Anthony Hinds (writer), Michael Carreras (producer), and most famously, Peter Cushing and Christopher Lee, the stars who topline the first of our Hammer films for today. HORROR OF DRACULA, originally released under the more simple but often-used title of DRACULA, is one of the earliest and best Hammer horror movies. It is the one that introduced Christopher Lee and the late Peter Cushing to their most famous roles – Count Dracula and Professor Van Helsing, respectively – and in doing so, made them kings to future generations of brilliant film fanatics as diverse in talent and influence as George Lucas, Joe Dante, Peter Jackson, and Tim Burton (all of whom cast either of the two repeatedly, in their own films). 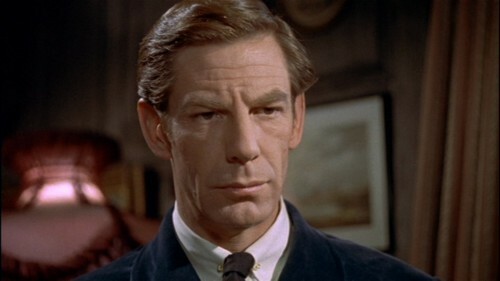 HORROR OF DRACULA also co-stars a young Michael Gough, who later appeared in Burton’s BATMAN and SLEEPY HOLLOW. Van Helsing tracks down Dracula’s castle, arriving to find Harker turned into a vampire. He dispatches his friend off-camera (though the Hammer films didn’t shy away from blood and murder on screen, they also used a fair amount of class and restraint) and heads back to London to inform Mina, who in this telling is not Harker’s fiancée. Instead, Lucy is. (More changes!) As in the novel, Lucy is turned vampire by Dracula, although by the time she appears in the movie, she’s already been bitten. She eventually becomes a full-on vampire and Van Helsing has to handle that also. I could go on and on about the changes from the book – Dr. Seward’s role is reduced to a couple cameos as the family doctor, there is no Renfield, etc. – but I think what the scholars mean when they applaud HORROR OF DRACULA and its fidelity to Stoker’s novel is that the spirit of the adaptation feels right. Dracula is the most compelling character in the movie – with a surprising minimum of dialogue, Christopher Lee plays him as a tall, dashing figure; ominous and threatening to men yet somehow magnetic to women (maybe he’s threatening to men because of that magnetism for women). Moreover, Van Helsing is the true protagonist of the film, and a perfect counterbalance to Lee’s Dracula. Dracula in this film is like a coiled snake or some other dangerous animal – he’s silent and still, bereft of emotion until he flares up and strikes at his victims – while in contrast, Van Helsing is an emotional figure, constantly fighting a horrific battle and laboring under the weight of constant loss, but he carries himself with the most English reserve. I like the scene where Van Helsing sits in his babe lair, propped up with the most rigid posture, listening to audio tapes of his own voice, dictating vampire-killing methodology. It’s a lonely life. Also, a lot of the changes make sense, at least for a movie not much longer than an hour. Van Helsing is always the most important of Dracula’s arch-enemies, and this particular story doesn’t suffer too much from the absence of Dr. Seward or the American, Quincey Morris. Michael Gough’s character, Mina’s husband, is named Arthur, so in that way he’s a stand-in for the novel’s Holmwood. Since a team eventually assembles by the novel’s latter half, it makes a kind of sense that Van Helsing and Harker were a vampire-fighting team. At the very least, it’s a creative, thoughtful change rather than a travesty. I could have done without the extra-long, extra-shticky scene at the shipping clerk’s office (you’ll know it when you see it), but maybe that’s a mid-century British cinema thing. Overall, HORROR OF DRACULA is a cool, classy Dracula film, a must-see for completists and real-deal horror fans, and a great gateway into the Hammer world. On the other hand, probably don’t start with this one. Not that THE BRIDES OF DRACULA isn’t worth seeing, but it’s like picking a book up in the middle. Or more like that episode of Lost where Jack hung out with Bai Ling and got a tattoo. With Christopher Lee’s character out of commission due to the ending of HORROR OF DRACULA, Peter Cushing has to fly solo in this outing as Van Helsing, which would fine except that he doesn’t show up until at least halfway through the movie. What I initially liked about BRIDES OF DRACULA is also its biggest downfall. An opening narration announces that “Dracula is dead” but there are still vampires to be fought – in other words, it picks up not long after HORROR OF DRACULA left off. (It’s the KARATE KID 2 of vampire movies!) The initial promise of that continuity quickly fades, as the movie spends a bit too long following a young French schoolteacher who is invited by a creepy baroness to stay at her mansion, only to be served up as a potential supper for the baroness’s son, who is a vampire. So the title is incredibly misleading – there is no Dracula to be found here. The main villain, Baron Meinster, is a blond ponce of a sub-vampire; he looks like the character actor Danny Huston in a blond wig. To my mind, it’s difficult to make blond guys scary. I don’t know why that is. Maybe it started for me with Ed from EVIL DEAD 2. Or maybe it’s innate, as a grand-nephew of a WWII veteran — I see Aryan traits and my instinct is fight, not flight. There’s just something about blond hair that doesn’t sit neatly on top of monstrous features, from where I’m sitting anyway. No matter the reason: This is one of the least intimidating vampire villains I’ve seen. Don’t let me scare you off this movie entirely. There is a scene where Van Helsing fights a large bat. And that’s amazing, obviously. But truth be told, that’s as close to Dracula as we get.